"Hallo, and welcome to da friendliest deer camp in da whole U.P." And you don't have to spend hours on the road to get there. 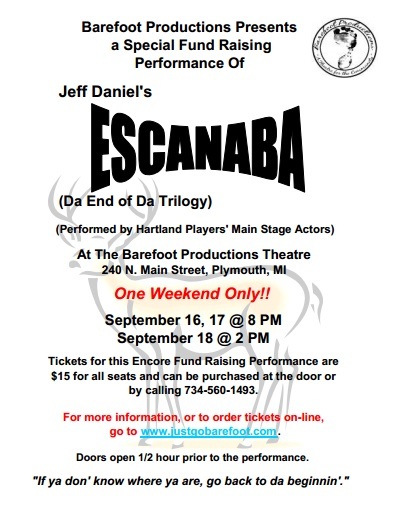 Barefoot Productions and the Hartland Players' Main Stage Theater, invite you to see an encore performance of Jeff Daniels' Escanaba for ONE WEEKEND ONLY (Sept. 16, 17 & 18)! This is a unique fund raising event put on by the Hartland Players, with special permission from the Purple Rose Theater, to help keep the doors open, and the performances coming, at Barefoot Productions, Plymouth's only live theatre company. 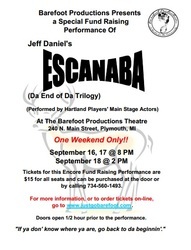 Escanaba takes you back in time to when Alphonse Soady (Tim Arrick) first builds the "world famous Soady deer camp". 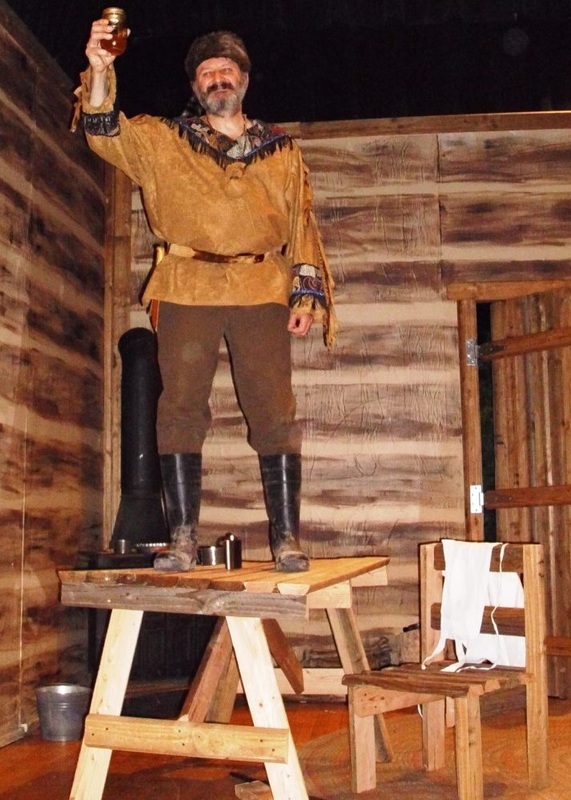 Alphonse is as green to a deer camp as the wood he used to build it, but when a black bear chases James Nagamanee from Menominee (Bill Brezina) into the camp, Alphonse's "man o' da woods" education really begins. 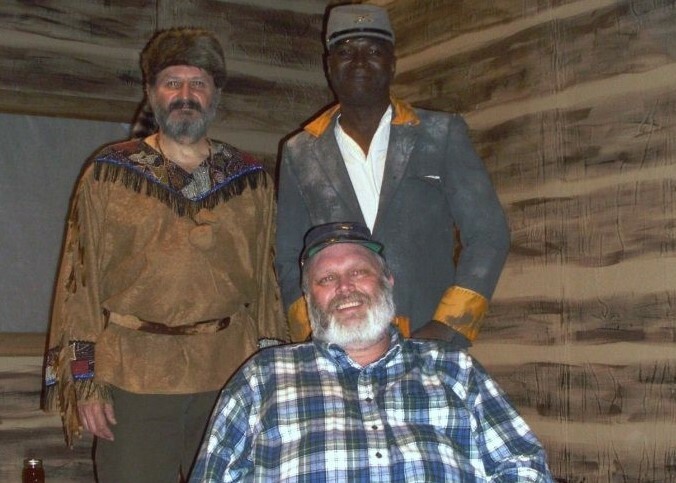 Both of them get a little unexpected help from the spirit of a civil war runaway slave named Black Jack (Deacon Acrie) and the Great Soady Ridge Buck. The show is funny, poignant and insightful as each person's "voyage of discovery" reveals their deeper character and the "true purpose of the Soady deer camp". 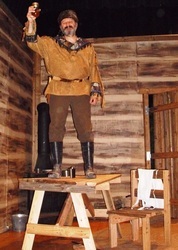 Do the characters build the camp, or does the camp build the characters? All this action is shrouded in the mystique, legend, superstition and humor of "da great Superior state". I would truly call it a "pure Michigan" experience. PLEASE SUPPORT COMMUNITY THEATER by joining us for an evening of laughs and fun on Sept. 16 & 17 at 8 PM, and Sept. 18 at 2 PM, at the Barefoot Productions theater, located in the former Walker-Buzenberg furniture store at 240 N. Main St., Plymouth, MI. Tickets are $15 and can be purchased at the door or by calling 734-560-1493. You can get more information about the show or order tickets on-line at www.justgobarefoot.com.